The annual 10-day festival features over 400 hundred free events throughout the Bay Area. Take dance classes and watch free performances in a wide range of styles including Argentine tango, classical Indian, jazz, hip hop, ballet, traditional hula, fire dance, Samba, modern, Chinese classical, belly dance, aerial dance, West African, contact improvisation, and more. 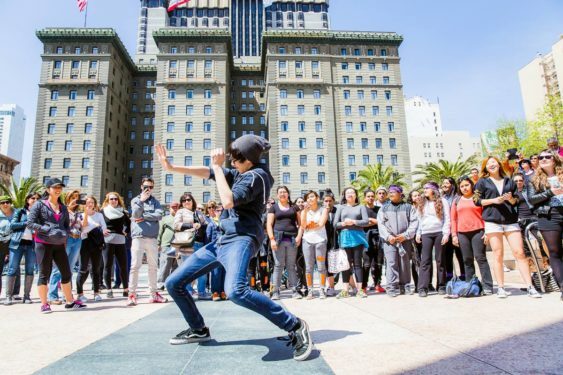 Flowtoys and Temple of Poi team up for this evening of play, education, expression, performance, exploration and glowing fun at the 2015 LED Flow Jam & nExtpo on Saturday, April 25 from 6:30 – 11:30 pm in Justin Herman Plaza, San Francisco, CA. 7 – 8:30 pm: Flow Jam* — come by and practice, play, watch, interact with others and have some flow fun. No experience necessary. 7:45 – 8:15 pm: Introduction to Poi Fire Dancing Class with Temple of Poi founder, GlitterGirl. They have the poi, you bring the willingness to be hit with them and together you’ll get you started on a life altering journey that may even lead to fire dancing one day*. 8:30 – 9:15 pm: Flow Down Showcase: Join Bay Area artists and special guest Thomas Nevisoul for an array of LED and UV reactive fun during this flow dancing exhibition. Bring a blanket and chair so you can be comfortable during the show and so people in the front can be low enough to not block those standing. Bring layers as it tends to get windy on the plaza. 9:15 – 11 pm: GlowFlow Jam with Flowtoys: Flowtoys will have a few samples on hand to try during the course of the jam so stop by and experience the led magic yourself. *No fire will be used during these events. Inspired? Take a free class and get started with LED (and eventually real fire!) flow classes. Where: Lines Ballet, 26 7th Street, Studio 4, San Francisco, CA. What: GlitterGirl is offering a free class for students interested in trying poi out for the first time. They have the practice poi, you show up ready to learn. Wear clothing with no strings hanging and not a lot of draping fabric. This class is for beginners with little to no experience. Where: Lines Ballet, 26 7th Street, Studio 2, San Francisco, CA. Please Note: No fire will be used during these events.